Fred Anderson Kia of Raleigh values quality in our certified vehicles. All of our certified Kia's have gone through 150-Point Quality Assurance Inspection regarding both safety and durability. Our certified vehicles never have more than 60,000 miles and are all five years old or less! Here at Fred Anderson Kia of Raleigh, over half of our used cars are certified giving you every model to choose with a used car price but new car nice! 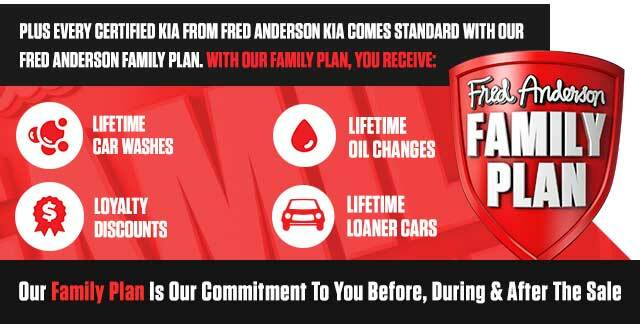 Plus, with any certified purchase, you receive the full lifetime benefits of our Fred Anderson Family Plan! Read below to learn more about the benefits of owning a certified Kia.